2014 Nissan Versa Note Pros and Cons: Why (Not) This Car? With stodgy styling, cheap interior materials, a buzzy engine, and flaccid handling, the Nissan Versa sedan looks and feels like the product of a new automaker rather than one of Japan's most experienced. So why bother testing the Nissan Versa Note hatchback? Well, it's not simply the little-loved (yet best-selling) sedan with a tailgate instead of a trunk. The Note (as it's marketed elsewhere) does share its underlying architecture, instrument panel, and powertrain with the Versa sedan. But Nissan aimed for a much different look and feel with the hatchback, and many other parts are not shared. Perhaps they've pulled off a sow's ear to silk purse transformation? I've pitted the Versa Note against the most stylish and polished car in the segment, the Ford Fiesta. Black color and good fabric choice redeem the interior. Why the 2014 Nissan Versa Note? "Oh, man!" my son groaned as I pulled up in the Nissan Versa Note. Nothing against the car's looks. He just noticed that the Note is a very small car and feared he'd feel cramped in the back seat. Then he opened the door. "Never mind." The Versa sedan does have a couple of strengths. To the sedan's surprising amount of rear legroom (some midsize sedans, two size classes up, don't have as much) the Versa Note adds another inch. Plus there's no coupe-like roofline, so unlike in the sedan rear seat headroom is also abundant. Adults well over six feet will fit. But they won't necessarily be comfortable. The seat back is reclined too much for my taste, and the seat cushion doesn't provide much in the way of thigh support. A shame given the amount of space Nissan's seating folks had to work with. Also, it's easy to get the rear seatbelts caught behind the latches when you fold the seat then return it to its full upright position. You'll discover this has happened when your kids can't buckle up, and you have to get everyone out of the car to sort the belts out. While the Versa Note has the roomiest rear seat in the segment, the Ford Fiesta has the tightest. The latter is a squeeze for even the average adult. Like that in the Versa sedan, the Versa Note's trip computer regularly reported averages in the low 40s in both suburban and highway driving. Drive the car with little regard for fuel economy and the average will drop, but only into the mid-30s. With a feather-light right foot and good luck with traffic lights I managed nearly 50 mpg in one trip home from my son's school. Trip computers often read one-to-two mpg high. Even if we assume that this is the case with the Versa Note, these averages impress. Based on EPA ratings, the Versa Note barely edges out the Fiesta, 31 mpg city / 40 mpg highway vs. 29/39. While these readings are typical of cars in this class and even the next one up (the Nissan Sentra is rated 30/39), it seems especially easy to achieve 40 mpg in the real world in either Versa variant. Tail light the most interesting aspect of the Versa Note's exterior. Controls much simpler and easier to use than the Fiesta's. But not remotely sporty. It's a tough call, whether to put "driving position & visibility" among the pros or the cons. So you'll find it in both sections. On the positive side of the ledger, the Versa Note is a few inches taller than most cars (including the Fiesta). Elsewhere in the world it's likely considered an MPV rather than a standard hatchback. This translates to a much higher, more upright seating position than in the Fiesta (yet a less minivan-like view forward than in a Honda Fit.) The Versa Note's large windows (a rarity owing to current automotive fashions) deliver excellent visibility in all directions. The Tech Package, an $800 option on the top trim level, includes both a navigation system and an around view camera system that provides a top down view of the car at low speeds. While I usually love the latter feature, the Versa Note is so easy to park that I found little use for it here. You not only sit lower in the Fiesta, but its instrument panel is unusually deep. In the other direction, like the Hyundai Accent and Kia Rio the Ford has a much smaller rear window than the Versa Note. 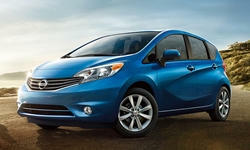 Why Not the 2014 Nissan Versa Note? Even among subcompacts, the Nissan Versa Note's 109-horsepower 1.6-liter four-cylinder engine ranks as weak. The CVT (continuously variable transmission) does what it can to compensate, taking the engine up near its power peak then holding it there when called upon to scoot. But holding the engine's speed constant as the vehicle's speed catches up would feel odd even if the engine's buzzy racket didn't discourage heavy throttle applications. I didn't mind this behavior so much because I rarely called upon the Versa Note to scoot. Most often I pushed down on the go pedal just enough for the CVT to hold rpm at 1,500 to 2,000. This yields leisurely acceleration--cars behind me often opted to pass--but as in a Prius a relaxed driving style just feels right. The Fiesta feels quicker and sounds more enthusiastic when hustled. But for the best combination of power and fuel economy in the segment, check out the Chevrolet Sonic with its optional 138-horsepower turbocharged 1.4-liter engine. The first-generation Versa had perhaps the nicest interior in the segment when it was introduced as a 2007 model. Thichly padded armrests were an especially welcome touch. You'll find no such padding in either Versa, sedan or Note. The instrument panel is similarly comprised of budget-grade hard plastic, and looks it. But, unlike that in the sedan, the Versa Note's interior isn't styled to look like that of the Lexus. Instead, with plainer detailing and some attractive blue-highlighted cloth on the door panels and seats, it looks like what it is, a functional subcompact. So the cheap materials aren't nearly as off-putting in this case. Still, the Fiesta's Euro-grade interior is considerably nicer. Surprising amount of rear seat room. Now for the not-so-good on "driving position & visibility," specifically the former. Unlike that in the Fiesta or the Sonic, the Versa Note's steering wheel does not telescope. For me, it's too much of s stretch, and I have to move the seat closer to the instrument panel than I would otherwise. This introduced my left knee to the hard plastic lower door panel. Depending on your bodily proportions, this might or might not also be an issue for you. If you have a relatively vertical neck, you'll find that the head restraints are positioned too far forward for comfort. Reclining the seat more than you otherwise would can help with this. But then the seat is reclined more than you would like. The Versa Note isn't a beautiful car. But Nissan successfully crafted a much different appearance than the sedan. Where the be-trunked Versa appears ill-proportioned, dowdy, and as if it's trying to look like a much more expensive car (and failing miserably), the Note appears much more youthful (especially in vibrant blue paint) and honest. For 2014, the Fiesta gains the Aston-like grille first seen on the 2013 Fusion. The Ford appears sleeker, more upscale, and generally more stylish than the Versa Note. But those who believe form should follow function could well find the Nissan the most attractive car in the segment. The Versa Note isn't entirely bereft of style. Check out the tail lights. Nissan gifted the Versa Note with a firmer, more tightly damped suspension than the 2012-2013 sedan. * Despite the car's height, roll in hard turns and understeer remain moderate. Body control over uneven pavement is much improved. The steering feels more direct and more naturally weighted than those in most competitors. As long as I wasn't asking much of the engine, I enjoyed driving the Versa Note, which is far more than I can say of the related sedan. The Fiesta handles better, with the solidity, buttoned-down poise, and effortless grace of a premium car, but its steering feels more vague. The systems in the Hyundai Accent and Kia Rio feel artificial and communicate next to nothing. The Mazda2 steers the best of the bunch, but it won't be a player until Mazda replaces the current engine, which feels much weaker than even the Nissan's while returning subpar fuel economy. * Nissan has retuned the suspension in the 2014 sedan, and it might now ride and handle more like the hatch. The Versa Note doesn't ride as smoothly as the sedan, with frequent jiggling and the occasional small kick. But it's far from punishing. Aside from the engine's racket during hard acceleration and some tire noise on tar strips and concrete, noise levels are fairly low. The Versa Note is much quieter inside than my aging Mazda. This said, the Ford Fiesta has the smoothest, quietest ride in the segment. Road imperfections that mildly jostle the Nissan are barely felt (if they are felt at all) in the Ford. The Chevrolet Sonic is a close second. This smoothness and quietness has a cost. The Ford and Chevrolet weigh considerably more than the Nissan. The Nissan Versa Note cannot swallow the most cargo in the segment. That honor goes to the Honda Fit, which can hold 57 cubic feet between a high roof (just a half-inch lower than the Versa Note's) and the low, flat floor formed by its innovative "magic seat." Some other competitors--the Sonic, Accent, and Rio--also claim more cargo volume than the Versa Note when their seats are folded (though some of these claims strike me as exaggerated). Assuming none of the numbers have been gamed, there's another explanation for the Versa Note's less-than-stellar max cargo spec. Its rear seat folds the usual, simple way, the seat back merely flopping onto a fixed seat cushion, with little apparent effort expended to minimize the height of the resulting floor. To create a flat load surface (plus a hidden storage compartment), the cargo floor behind the seat can be raised. You might not be able to cram in as much stuff as in a Fit, but you can fit about 50 percent more than in a Fiesta, 38 vs. 25 cubic feet. This is with the rear seat folded. With it up, the Versa Note edges out the Fit for the top spot, 21.4 vs. 20.6 cubic feet. The Fiesta, Accent, and Rio are in the mid-teens. A key difference: just as the Nissan's rear cargo floor can be raised to create a level floor, it can be lowered to maximize volume behind the rear seat. The Nissan Versa Note doesn't look as cheap as the sedan, and it's not as cheap, with a starting price $2,000 higher, $14,780. Jumping up a couple of trim levels (from S through SV to SL) adds niceties like 16-inch alloy wheels, a key that can stay in your pocket, and heated seats. Add the Tech Package mentioned earlier, and the total comes to $19,280. This might seem like a lot for a small hatchback. But it is a small hatchback with features you couldn't even get on a luxury car a decade ago. Don't want them? Then get the SV or even the S.
If, on the other hand, you want leather seats, a sunroof, and other luxury car fare in your small hatckback, then check out the Ford Fiesta and the Kia Rio. With any of these cars save the Honda Fit (which checks in $1,300 above the Nissan) , equip them similarly and they'll end up with similar prices. For example, a Ford Fiesta SE with Appearance Package and nav lists for $19,780, $450 more than the tested Versa Note. But it includes about $425 in additional features. Adjust for these, and they're nearly dead even. Though it has the same buzzy powertrain, I enjoyed my week with the Nissan Versa Note much more than I did my week with the Versa sedan. The hatchback looks more youthful and handles more athletically, while also easily cracking 40 mpg. Outward visibility is much better than the current norm. Even tall people can fit in the back seat. Your stuff should also fit. So, while the Versa Note might not be a good pick for driving enthusiasts, for young drivers or anyone seeking a practical car it would serve well. Great fuel economy. Can move the car, but not without unpleasant noises. Specs say others can hold more, but only the Honda Fit appears more spaciousness. Nissan provided an insured Note for a week with a tank of gas.Bob Bucknum at Suburban Ford in Waterford, MI, helpfully provided the comparison car. He can be reached at 248-674-5626. 2014 Nissan Versa Note pros and cons, according to Michael Karesh: the best reasons for buying (or not buying) the 2014 Nissan Versa Note. Join TrueDelta to post your own impressions.